LONDON, July 3, 2016 (Xinhua) -- People take part in a march against the outcome of the recent EU referendum, in London, Britain, July 2, 2016. 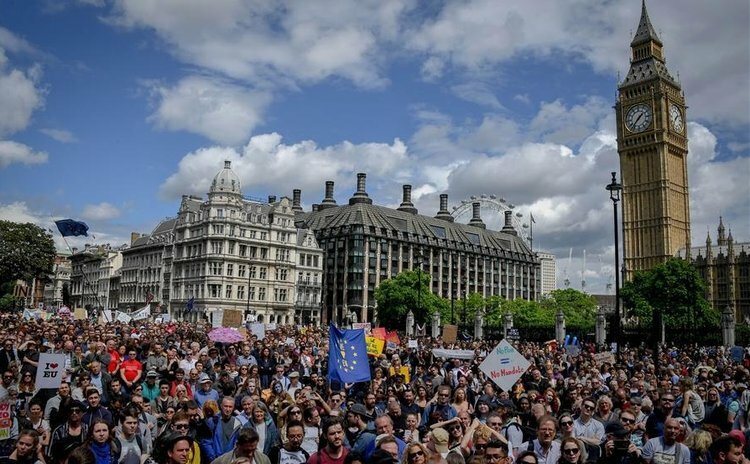 LONDON, July 2 (Xinhua) -- Large areas of central London were brought to a standstill Saturday as thousands of demonstrators converged on the capital to protest about the outcome of the EU referendum. The peaceful march and rally came in the wake of a petition to parliament which by Saturday had exceeded 4 million signatures calling for a second referendum. It is estimated that around 40,000 people took part in the march. With people waving pro-Europe banners, the "March for Europe" event took place even though the Leave camp won the June 23 referendum by 51.9 percent to 48.1 percent. One banner carried the message "Stay Calm but Remain...Outraged" while another had the message "We Love EU". Starting from Park Lane in Central London, the procession stretched for more than three kilometers as it made its way towards Parliament Square, close to the seat of the British Parliament. One of the organisers of the London march, Keiran MacDermott, said protesters want to stop the British government from triggering the mechanism that starts the EU withdrawal process, making a Brexit irreversible. Stand-up comedian and satirist Mark Thomas said he helped organise the march to "address his anger, frustration and need to do something." He said: "We would accept the result of the referendum if it was fought on a level playing field. But it was full of misinformation and people need to do something with their frustration." With the House of Commons and Big Ben as a backdrop, speakers from different political parties heard pleas about the impact of the emerging "divorce" from the European Union. Rock band icon Bob Geldorf, who famously helped raise millions of pounds for starving people in Africa with a desperate plea for help, was among the speakers Saturday. He urged people "to take to the streets and speak to their neighbors" to stop Britain from leaving the EU. Politicians and officials within the Palace of Westminster have already started laying the foundations for Britain's exit by establishing various working groups to discuss future moves in the long process. In the referendum, London was out of step with the rest of England where the vast majority of people backed the Leave camp. Wales also was a strong supporter of Brexit, with both Scotland and Northern Ireland voting Remain. Around 60 percent of Londoners voted for remain. Social media sites went into overdrive, with both sides engaged in verbal clashes. One person wrote: "I agree we have a democratic right to protest, but I don't see how 'March for Europe' is going to work. Leave won in a democratic vote."